Barbara Janulis is a Duke alum, class of 1983, and her husband, Ted Janulis, is a Harvard alum who has been converted to equally bleed Crimson and Duke Blue. 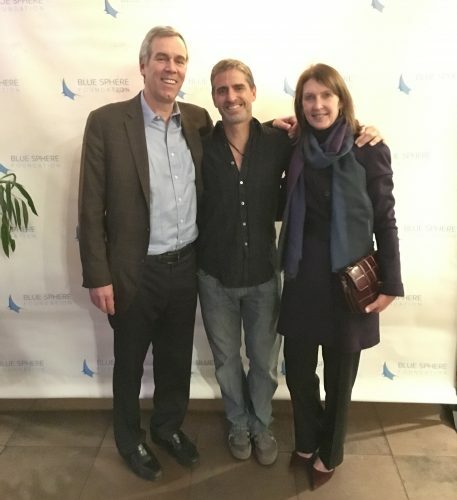 In this photo, they are shown with Shawn Heinrichs (center), marine conservationist, cinematographer, photographer, featured activist in the documentary Racing Extinction and founder of Blue Sphere Foundation. We asked them to share a bit about their connections to Duke and to DukeEngage, and Barbara generously agreed. I reconnected with Duke as my 25th Reunion was approaching in 2008, coincidentally and fortuitously, just as DukeEngage was sending off its first cohort in the summer of 2007. Ted and I continued our development conversations with Cynthia Baker — who recognized our family’s interest in civic engagement as evidenced by my work with The Posse Foundation and our high school son’s co-founding of a 501(c)3 microfinance organization — and smartly highlighted DukeEngage as a potential area of interest for us. We were so inspired by Eric Mlyn’s leadership as executive director and by President Brodhead’s commitment to DukeEngage, along with their firm belief that the program was not an extracurricular activity, but instead an important part of an undergraduate’s education. We were hooked — and decided to support DukeEngage as part of our family’s philanthropy. As I learned more about DukeEngage through my participation as a DukeEngage National Advisory Board (DENAB) member, it was evident how integral the community partners were as co-educators of our Duke students. We are the parents of three children who, like many students coming to Duke, had not ventured much outside their comfort zones. That’s where the magic of the “messiness” of DukeEngage comes to play — with Duke students working in the real world with community partners, learning that they don’t have all the answers, realizing that humility is paramount, understanding that they are there to provide what is most helpful to the community that they are serving — that’s what the summer is all about. Eric Mlyn brought to the board’s attention the importance of building strong bonds with our community partners and had on his wish list hosting a Community Partner Conference at Duke so that there could be conversation, information sharing, and reflection. Ted and I shared his enthusiasm for making this happen, and we helped fund the first conference two years ago and the second one just this past November, which was planned to coincide with the Decade of DukeEngage celebration so that our community partners could join us for the special evening. What inspired you to support specific DukeEngage themes/programs? With respect to supporting specific programmatic themes of DukeEngage, Ted and I are very much focused both professionally and personally in the environment/conservation space. For the past three years, Ted has served as president of The Explorers Club, a not-for-profit professional organization founded in 1904 by polar explorers, whose mission is to support and enable exploration of the world and universe around us. Conservation has always gone hand-in-hand with this mission, and it has never been a more important and critical issue than it is now. We are also co-owners of an environmental digital media site called EcoWatch, which is charged with engaging and energizing current and future environmental stewards through our content. We both passionately believe that the environment and conservation programs of DukeEngage provide an incredibly important opportunity for students to gain awareness in this space, and we felt compelled to endow a Director’s Exploration Fund to help create and sustain programs that allow students, faculty and partners to address some of the most pressing environmental issues facing our world today. Many DukeEngage students work side-by-side with community partners who are dedicated to making a real difference in protecting the planet that we all need to thrive, and we are deeply gratified to be able to help as many of those students as possible become environmental stewards in their own lives, no matter what career paths they may choose.